Situated halfway between Zadar and Split is the Krka National Park with the Krka River flowing through it. It is a karst region and the river has carved lakes, caverns, and cascades through the porous rock. 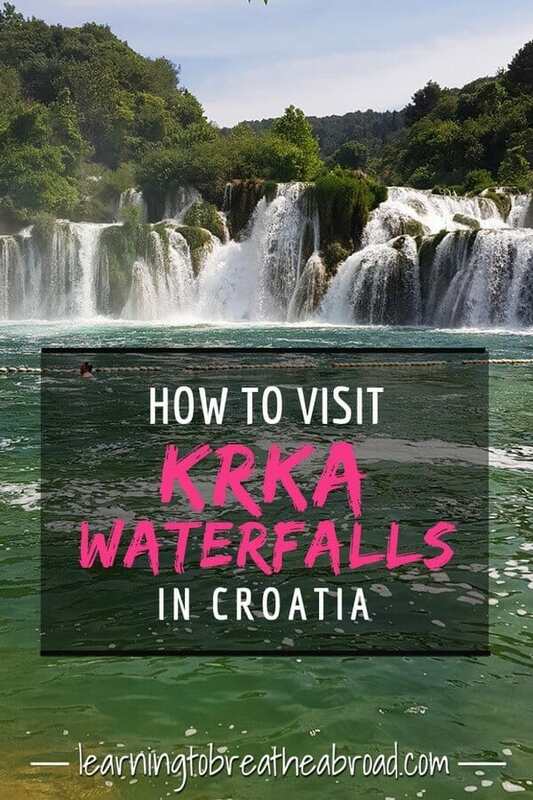 Krka is best known for its series of 7 waterfalls, the most famous being the Skradinski Buk Waterfall, which is the largest travertine cascade system in Europe and probably the most impressive falls I have ever seen! 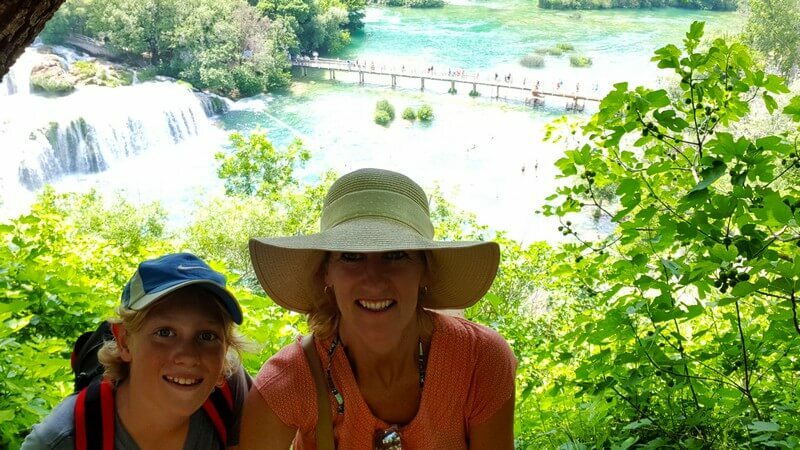 The two main entrances are at Skradin and Lozovac, but we opted to start at Skradin as this included a boat trip along the river to the falls. The first sight of the falls was breathtaking! An immense volume of water, thundering over a labyrinth of travertine ledges, into a crystal clear river. Nature at its best! There was a circular path leading up the right of the falls, so we crossed the bridge and walked up – taking photos every few minutes because you can’t help yourself! We soon realised that the falls at the bottom were just the last in a series of falls, each one just as beautiful as the next. At the top of the falls was an old village with watermills, where we could see a mill and a blacksmith still in action. 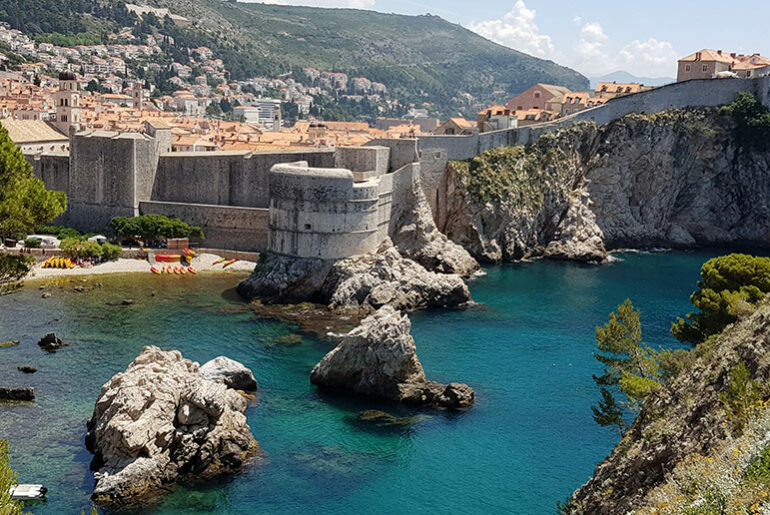 These villagers certainly have the best views in the world! Above the falls were a series of turquoise blue pools with wooden walkways meandering through the trees. We were accompanied by a chorus of frogs, each male trying to outdo the next, with hundreds of females and babies sunning themselves on the lilypads. Below them saw hundreds of fish with dragonflies skimming the surface above them. Once back at the main falls, we couldn’t wait to jump in and have a swim. It was freezing, but even I got in and had a paddle about! The current was surprisingly strong so I was glad they had a rope with buoys sectioning off the swimming area. 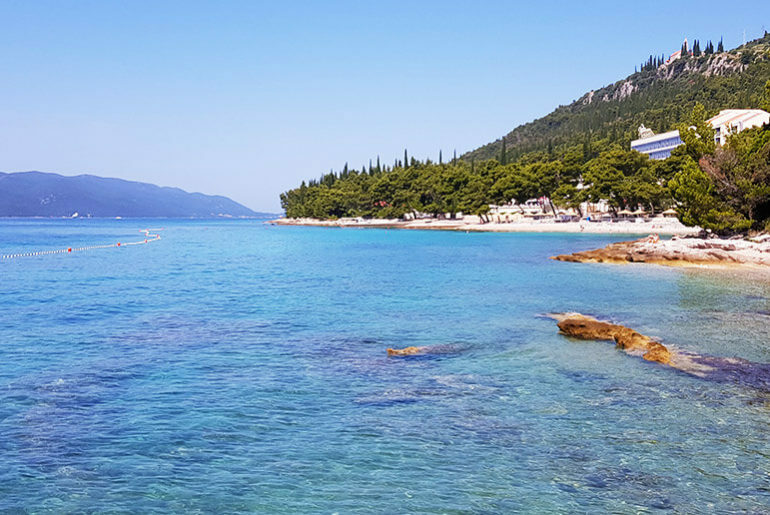 We had been told it would take us 2 hours to do the falls and boat, but when we got back to Skradin town, we realised we had loved it so much that we had taken more than 4 hours. We then jumped into Miles and drove further into the Park to Visovac Lake. 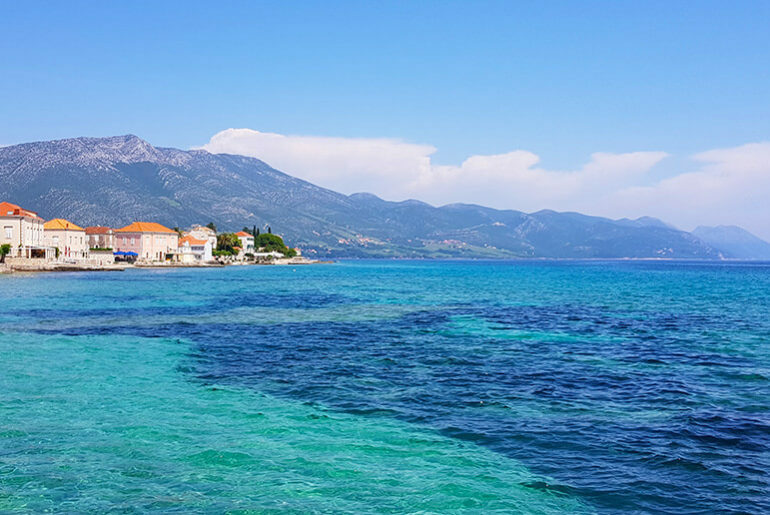 Perched in the middle of the lake is Visovac Island, home to the 15th-century Franciscan Monastery of Our Lady of Mercy. We found some men fishing off the jetty so hung out with them for a bit. I had seen photos taken of the monastery from above but that viewpoint was on the other side of the lake, so you need to drive up from Lozaovac to get that shot. We then headed even further to another set of falls called Roski slap. Roski Slap is a series of shallow falls spanning a 27m stretch of the river. I had been told that the best viewpoint was from the Ozidana cave, so not being put off by the ominously steep looking stairs leading up the mountain, off I set. Tai had begged off, so I’d left him in the van. Up and up I trudged until I got to a sign saying I had done 293 steps and had 224 steps left to go. It is not in my nature to quit at anything, but it was 6pm and it had been a long day and I just couldn’t find it in me to go the distance on this one, so I took a few snaps and headed back down. Plitvice Lakes were amazing, but I personally thought Krka was more beautiful. There weren’t as many tourists and we got to swim, so Krka definitely got our thumbs up. 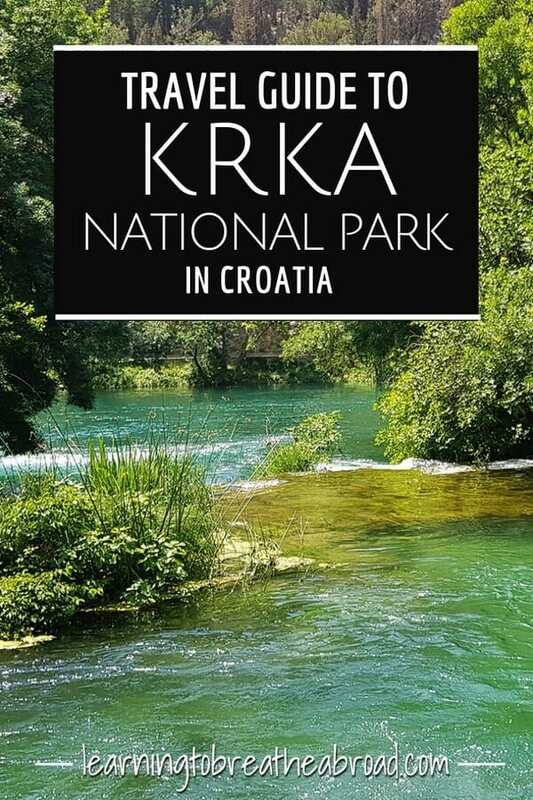 There are 5 official entrances for National Park Krka, the two main entrances are Skradin and Lozovac. From Skradin you need to take the boat to the main waterfall. From Lozovac, you need to drive to the ethno village and walk from there, except for July and August, where a bus will take you from the main entrance car park to the Skradinski Buk waterfall. If you are coming by car to Skradin, there is a large parking lot, right in the centre of town and only 200m from the ticket office. There are lots of touts pushing other parking as you enter the town. Just ignore them and continue to the main parking. You can always go back to them if the main parking is full. The cost is 10Kuna per hour. 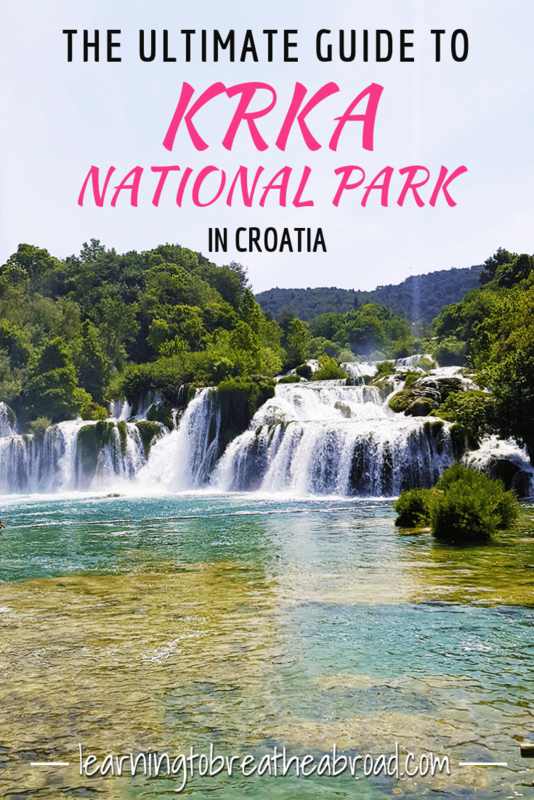 The entrance fee to Krka National Park is 110 Kuna for Adults and 80 Kuna for Kids. This includes the boat trip from Skradin to the Skradinski Buk waterfall. The boat goes leaves Skradin for Skradinski Buk waterfall on the hour and returns from the waterfall on the half hour. The last boat leaves the waterfall at 5.30pm in summer. The boat trip lasts about 25 minutes and the walk to Skradinski Buk waterfall is another 5 minutes. Please note that the boat only runs from April to October. For those feeling energetic, there is also the option of hiking or cycling along the 3.5km path from Skradin to Skradinski Buk waterfall. You are allowed to swim at the main waterfall (Skradinski Buk waterfall), so pack your costumes, although be warned, the water is icy! There are lots of stalls at the main waterfall, selling drink, food and most importantly, ice-creams. We were told it would take us 2 hours to complete our trip, but we loved every minute of the waterfalls so ended up taking 4.5 hours.